CMI Wall Safe WS3C Combination Locking. CMI Wall Safe Combination Locking WS3C. Please note, this is an as to order item and is not kept in stock. Product Details: CMI Wall Safes are designed to fit into a standard cavity brick wall. LOCKING: Anti punch bridge on combination lock model. Changes to the combination are easily made by safe owners. Mounted on hardened steel drill resistant plate. DOOR: Heavy 12mm steel door plate 12mm rear dog plate to ensure security even if hinges are cut through BODY: Heavy steel body reinforced with steel bar all round front edges HINGES: Concealed 12mm hardened steel hinge pins. All models have one removable shelf All models have 4 each 12mm x 75mm bolts to extend into brick cavity. 152mm(H) x 305mm(W) x 152mm(D) Weight: 14kg. We are a well-established locksmiths and door hardware company that is 100% Australian owned and operated. We have 1000's of happy customers. Our staff have over 50 years industry experience. We are qualified locksmiths, Master Licence No. We nearly always use Australia Post. Parcels over 22kg will need to be sent with couriers. Gainsborough Sash balances are made to order and are not returnable. 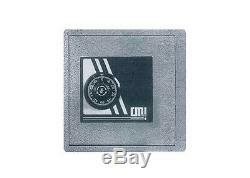 The item "CMI Wall Safe WS3C Combination Locking" is in sale since Sunday, January 13, 2013. This item is in the category "Home & Garden\Home, Personal Security\Safes". The seller is "sydneycentrallocksmiths211" and is located in North Willoughby NSW. This item can be shipped worldwide.